Tanzanian and Chinese officials and diplomats Tuesday hailed the two countries' cooperation in wildlife conservation. Gaudence Milanzi, Permanent Secretary in the Ministry of Natural Resources and Tourism, said Tanzania looks at China as an important partner in conservation. "It is evident that the future of wildlife conservation depends on the involvement of different players in planning and implementing measures to combat poaching," said Milanzi. 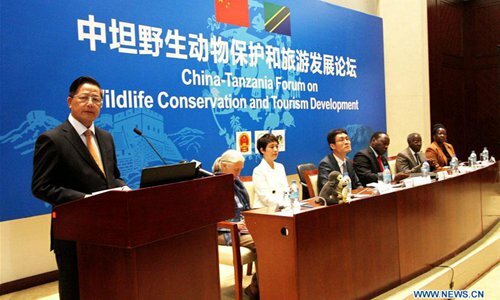 Hu Zhengyue, vice president of China Public Diplomacy Association, which co-hosts the event with Tanzania Tourist Board and the Chinese embassy in Tanzania, said China was very concerned with protection of wildlife. He said the ban on ivory trade in various markets in China was a symbol of the country's commitment in conservation. Xu Chen, Minister-Counselor of Chinese embassy in Tanzania, said the Chinese government cooperated actively with the international community on wildlife conservation. He added that to improve inspection capacity on wildlife product trafficking, China has donated container inspection facilities to Tanzania. "China has also spared no effort to advocate for wildlife conservation and educate the Chinese community in Tanzania on the importance of raising awareness on wildlife protection," Xu said.